Koni Coilover Kits - Dezod Motorsports Inc - Home of the automotive performance enthusiast since 2002. So you consider yourself a sporty driver? You demand the very best in road holding? And you don’t mind if that comes with a stunning appearance? Koni is right there with you. Koni’s Coilover Kits consist of four chrome Koni Sport Shocks and matching silver/grey lowering springs. They offer adjustable lowering of up to 60 mm, more than enough to give your car absolutely superb road holding qualities and great looks as well. We offer a complete range of Kits. Engineered in a joint effort by Koni’s Motorsports Divisions in Holland, Germany and North America, these kits are all tested extensively on Germany’s high speed Autobahns and approved by TÜV. 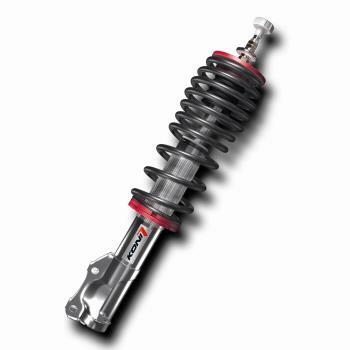 The Coilover Kits have highly polished chrome threaded bodies, or sleeves, providing a variable lowering by adjusting the spring seat height. This allows you to individualise your ride height. The dampers are also rebound adjustable, allowing you to further customise your cars ride and handling. Most of these can be adjusted by a knob on the top of the damper from under the hood.